In the world of home décor, gallery walls are all the rage. 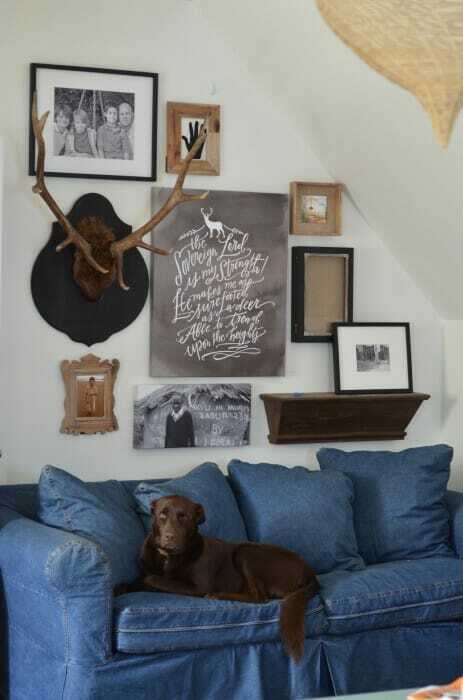 Pinterest is full of enviable homes with walls covered in eclectic collections of photos, prints, wooden signs, decorative plates, and maybe even a pair of antlers or two that somehow come together to form a beautiful, cohesive wall collage. If you see yourself as less artistically-minded, you might be intimidated by the idea of a gallery wall. Not to worry. Here are some tips on how to put together a mixed-media gallery wall that wows. No artistic ability required. Start With a Featured Piece. Arrange it on the Floor First. 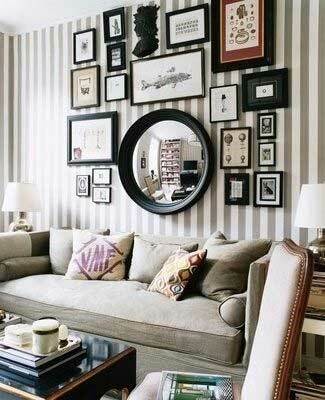 The first thing to consider when deciding which pieces to include in your gallery wall is the wall itself. 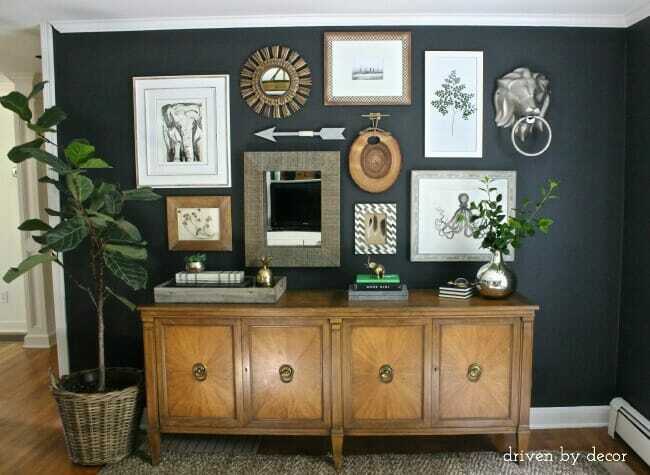 The color and size of the wall, as well as any furniture that sits against it, will influence both the size of your collage and what kinds of items to include. 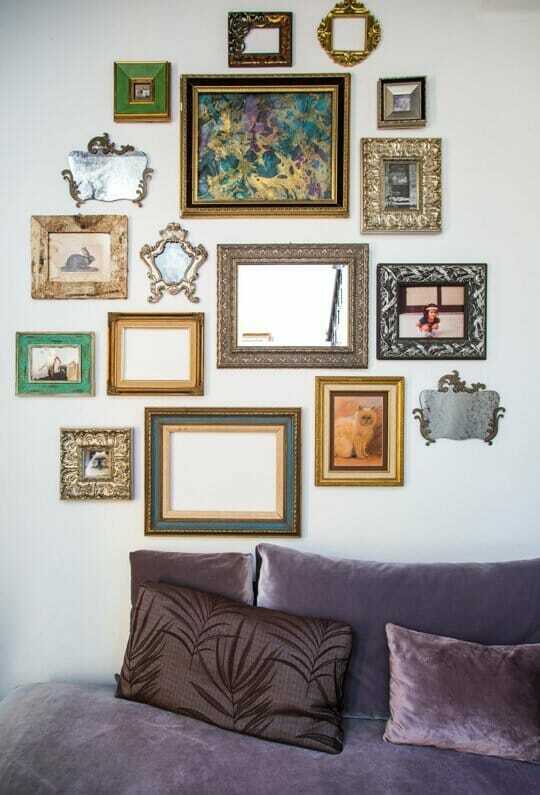 If you have a large, empty wall, you might want to choose larger pieces that can fill out the space. 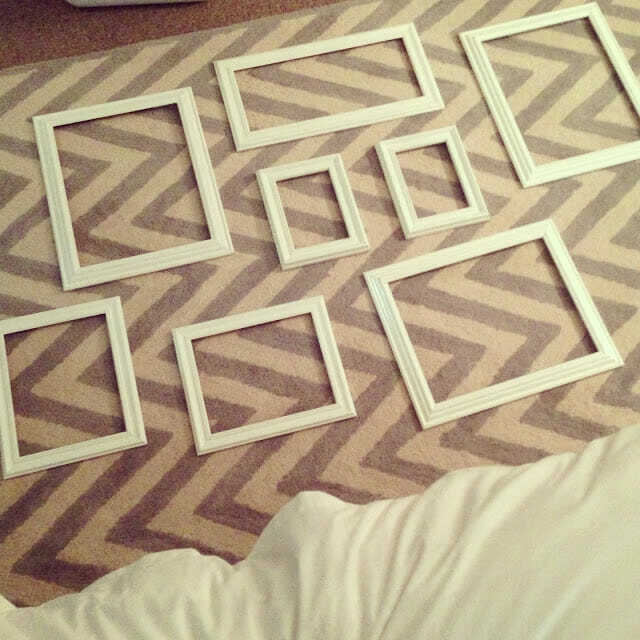 If the wall has a unique shape, you will want to plan your gallery to follow the shape of the wall. If your wall is already a bright color, you might want to use more neutral or muted colors in your gallery pieces. This gallery is arranged roughly in the shape of a right triangle to accommodate for the slant of the wall. 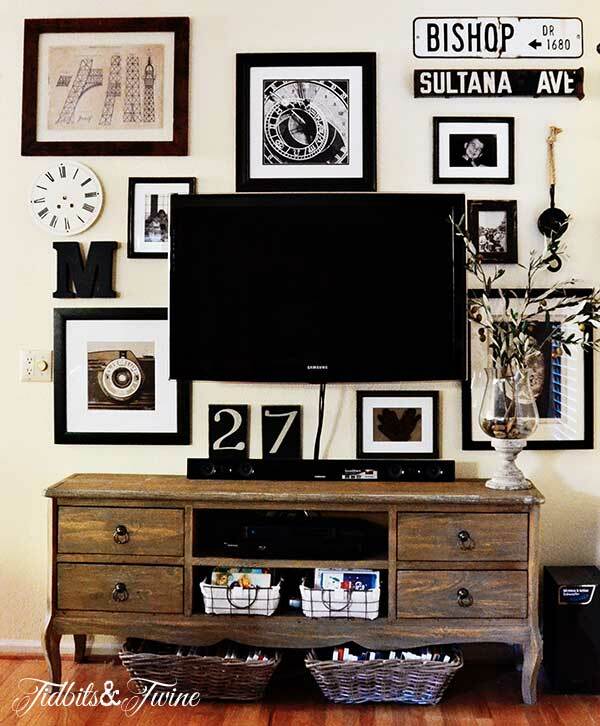 While a gallery wall doesn’t need to have one featured piece to look good, choosing a piece to serve as the center or focus your collage can help you get started. The featured piece will likely be the largest piece you want to display, or one with a unique shape or style. It should be a piece you love and want to draw attention to. The featured piece can be a painting, a print, a photo, or a sign. You can also choose to have several larger pieces that take up the majority of the space while using the rest of your items to fill in the space around them. Once you’ve chosen your featured piece or pieces, you can start adding to your collage by building around them. In this home, the TV itself serves as the featured piece with the other pieces arranged around it. If you look at most wall collages, you’ll find that even collections that seem random and eclectic have a sense of unity that gives them the look of a carefully curated collection rather than a hodge-podge of random junk. This is because while each piece is unique, all of the objects have something in common that ties them together. For example, if you want to use frames of varying shapes, sizes, and styles on your wall, you can keep the color of the frames consistent to create a unifying element. If you’re using a lot of different shapes and interesting textures, keep the overall color scheme simple. The items in this gallery are eclectic, but they stick to a similar color scheme of black, white, and a pop of blue. The human eye responds to symmetry with a sense of rightness and peace. We naturally want things to feel whole, complete, and balanced. Just like photographers apply the rule of thirds when framing shots, interior designers use a rule of threes for decorating. When objects on a wall or on a surface are arranged in groups of three, the brain can interpret them as a pattern, even if the pieces are different sizes or shapes. Other odd-numbered arrangements (5, 7, and 9 for example) also work well. If you are using a feature piece as a focal point for your collage, balance the other pieces to either side as you arrange them. You can also create visual balance in the types of media you use. While there are no fixed rules about how many photos to use versus metal signs or mirrors, etc., you should go for a balanced look. Instead of keeping all of the same kinds of pieces together in one section, try to intersperse them throughout the gallery. This gallery has three central pieces with many small items arranged around them. The overall number of items is odd, and items with unique shapes (such as the two plaques with vine designs) have been staggered to create symmetry in the pattern. Before you put holes in your walls, clear a space on the floor and arrange your pieces the way you’d like to put them on the wall. This will help you visualize the whole thing together and will make it easy to try out different arrangements before committing. The only tricky thing about hanging your wall gallery is being sure to space things out evenly on the wall while making sure to put the nails in the right place for each piece’s hanging fixtures. One way to make this easier is by tracing each item onto butcher paper, cutting out the shape, and marking the places where the nails should go on the paper. Once you’ve done this, you can tape the paper cutouts to the wall and make sure they are spaced correctly. Your pieces should hang around 3 inches apart. Hammer nails through the paper into the spots you’ve marked. Then simply tear the paper outlines away and replace with the actual items.